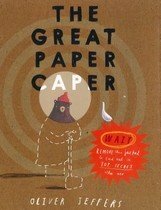 The Great Paper Caper Review: There's a mystery here which needs solving! Someone, or something, is cutting down branches in the forest. The forest animals - and people - put their collective heads together and begin an official investigation to identify the offender. With some sleuthing and clever problem solving they soon discover that the culprit is the bear, who needs the wood to make paper to win, improbably, a paper airplane competition. The Great Paper Caper has a mild environmental message - protect our forests. The bear is punished for his transgressions, and is sorry for cutting down the forest's trees. The animals soon forgive the bear and he presumably goes on to win the paper plane competition, but must first plant new seeds for the trees he has lopped. The story is simple and engaging for younger readers, though adults might find the tidy resolution a bit twee. A real strength of the story is that it introduces the concept of the criminal justice system in a very clear but unthreatening way for young people. There is the crime (someone is unlawfully cutting down trees), there is a miscreant(the bear), a judge (the deer), a detective (the beaver), a prosecutor (the pig), and there is a trial and punishment for the bear's crime. Another plus, and a real bonus in all Oliver Jeffers books, are the illustrations. Each seemingly simple picture has hidden details; and each panel is filled with quirky humour. There are literally dozens of inference type questions that can be structured from each illustration.